Home Kidney Disease How do our kidneys work? When we eat, our bodies absorb nutrients from our food and discard what we don’t need. These wastes enter the bloodstream and must be filtered out through the kidneys. Blood flows into the kidneys through the renal arteries, reaching the kidney’s key filtering units – the nephrons – through a complex network of blood vessels. Each kidney contains about a million nephrons. Each nephron is made up of a coiling tuft of capillaries called the glomerulus (Latin for “little ball”), surrounded by the Bowman’s capsule, which resembles a hollow, cup-like sac with a long thin tube or tubule at one end. 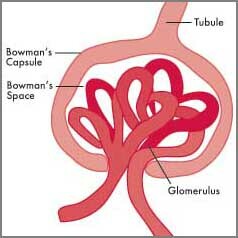 Within the glomerulus, filtration is driven by the blood pressure and the capillary pore size. Red blood cells and big proteins remain in the blood flow and return to the body through the renal vein. Salts, sugars, urea and water are forced through the capillaries, emptying into the space within the Bowman’s capsule, known as Bowman’s space, then down into the narrow tubule. Inside the tubule, some of the water, salt, sugar and other substances are re-absorbed into the body to maintain the proper chemical balance. The remaining waste product, urine, travels from the winding tubules to the ureters, down to the bladder and out the body through the urethra. While our kidneys filter about 200 quarts of blood each day, only about 2 quarts leave the body as urine.